Eight shot, one in the head, as thousands of rioters confront IDF forces on Gaza border one day after demonstrator killed. Thousands of protesters converged on the Israeli border with Gaza Friday afternoon, launching another series of clashes with Israeli security personnel as the so-called “March of Return” begins its third week. Rioters hurled stones at Israeli soldiers at two separate demonstrations on the Israeli-Gaza border, AFP reported. 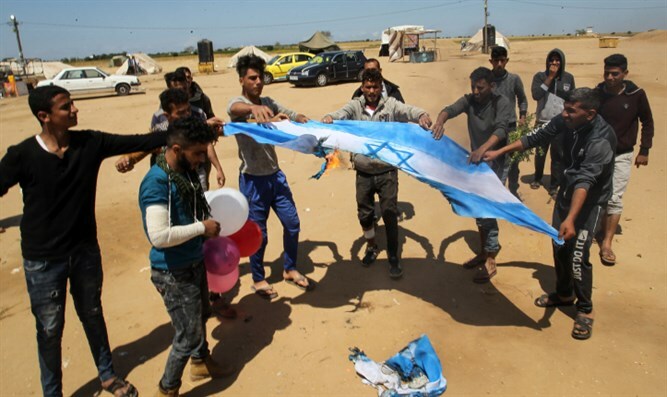 Protesters on the northern edge of the Gaza Strip torched an Israeli flag as part of the demonstration. Health officials in the Gaza Strip claimed three demonstrators were shot and wounded. Thirty-three Gazans, including 14 people identified by Israeli security officials as terrorists, have been killed since the riots began on Friday, March 30th. Organizers in the Hamas-ruled Gaza Strip have called on Gazans to march en masse to the frontier with Israel and cross over into Israeli territory. Israeli officials have warned demonstrators not to approach Israel’s security fence, adding that snipers will use live-fire on rioters who engage in violence or approach the 500 meter (1,640 foot) buffer zone along the frontier. In previous demonstrations, rioters have hurled firebombs and flaming tires at IDF forces, while terrorists have made several attempts to conduct attacks on Israel forces, using the demonstrations as cover. The protests are expected to last through May 15th, one day after the 70th anniversary of Israel’s establishment and the planned unveiling of the new US embassy in Jerusalem. One rioter was shot and killed Thursday evening, Gaza health officials claimed, during demonstrations on the border between southern Gaza and Israel. The Quran who the pope says is holy ?